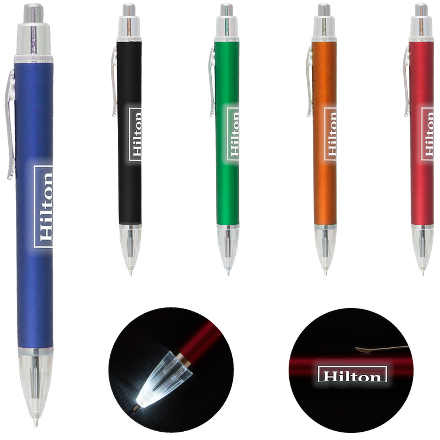 Swag light-up logo and writing tip! Your logo is laser engraved so light shines through when you press the plunger. The refill tip extends out through the nose cone of the pen with a twist of the cap. This pen comes with a Super Glide refill that provides an exceptional writing experience, delivering a consistent ink flow to produce non-skipping writing and smooth fine writing line. Large plastic barrel with chrome clip and accents. Black ink.